The GeForce GTX 980 Ti for most users is currently the second- best graphics card for gaming, just behind the much more expensive Titan X. In our initial GTX 980 Ti review, we saw how it surpassed every single-GPU graphics card, with the exception of the Titan X, and even then it wasn’t far off. Then we turned up the clock speeds and overclocked the 980 Ti, adding on average 17 percent more performance than the stock-clocked card. Now, it’s time to crank the dial to 11 and see how two 980 Ti cards perform in SLI. It takes a special kind of gamer to go out and spend $650 on a GTX 980 Ti—you have to really be dedicated to the craft (or have a lot of disposable income). But the type of gamer willing to shell out for two $650 graphics cards is a rare breed indeed. Anyone running a single 1080p display should simply forget about splurging on a couple of 980 Ti cards; a single overclocked card is generally sufficient. But if you have a 4K display, or three 1080p displays for surround gaming, then multiple 980 Ti cards might be something to consider. And hey, we’re Maximum PC, so we’re as excited as anyone to put these cards through their paces. For our testing, we have two of EVGA’s GeForce GTX 980 Ti ACX 2.0+ graphics cards. 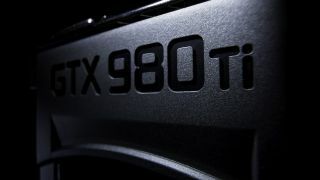 Unlike the Titan series, Nvidia gives the card manufacturers more freedom with 980 Ti, so we’re likely to see a greater variety of clock speeds and cooling configurations over time. The ACX 2.0+ comes with a mild overclock to 1,102MHz on the core (boost clock of 1190 MHz), but the GDDR5 remains at 7,010MHz (effective). EVGA also offers a stock GTX 980 Ti, which is priced $30 lower and should deliver the same level of performance when overclocked. It’s worth quickly pointing out that we ran into some issues with Metro: Last Light using the latest drivers, at least with our SLI setup. Single-GPU performance is up for the game by 5 percent or so on 980 Ti, but SLI scaling appears to have been borked in the process. So, we tested with the earlier beta drivers for now. It’s a bit odd to see such an old game run into problems, but since it does appear Nvidia has tweaked GM200 performance for that title, it’s not too surprising. We’ve notified the appropriate parties and we’ll likely see a fix in the next driver update. Also note that since the EVGA cards come factory overclocked, performance will in general be slightly higher than what we measured with our initial review. Games were tested at maximum quality, with all non-proprietary features (e.g., not PhysX and TXAA) enabled. 4xMSAA is used in all benchmarks that support it (everything but Metro: Last Light, Shadow of Mordor, and Tomb Raider); SSAA was not enabled. Yes, you could turn off 4xAA on a 4K display and probably not miss it much, but we left the settings alone for consistency. Even at the high end of the performance ladder, there are still a few rungs left to climb. At 1920x1080, we only sees an average improvement of 42 percent, but that’s still pretty impressive; run at 2560x1440 or 4K and even more reason to look at 980 Ti SLI. We do need to temper expectations with the understanding that less-demanding games typically don’t scale as well, and sometimes even demanding games run into other bottlenecks—or in the case of The Witcher 3, there’s likely room left for driver optimizations. Meanwhile, Tomb Raider isn’t really known for being that demanding, but it’s the poster child for GPU scaling, nearly doubling in performance at all three resolutions. If you’re wondering why people would even chase such high frame rates, we’re seeing advancements in display technology now that finally make breaking 60fps useful. We discuss this more in our guide for the best gaming displays, but there are now 2560x1440 displays that support refresh rates of up to 144Hz, and 4K panels with 60Hz refresh rates. More importantly, these displays support dynamic refresh rates, so you can run at anything from low to high fps and still get no tearing and reduced latency. Gaming at 4K with G-Sync as an example works okay with a single 980 Ti (depending on the game, e.g., GTAV and Witcher 3 are pretty choppy without dropping a few settings), but with two cards the experience is greatly improved. But for our money, the QHD 144Hz displays are currently the best overall experience. But there’s a dark side to multi-GPU: minimum frame rates don’t always scale all that well. In fact, we’re sort of showing the best case for minimum frame rates here, as there are certainly titles where enabling SLI will cause a drop in performance, particularly when it comes to minimum frame rates. This is particularly true of recent releases, though the bigger the title, the more likely it is to get the necessary TLC from Nvidia and AMD to work well with multiple graphics cards. What will really make SLI and CrossFire take flight is DirectX 12, which promises vastly improved multi-GPU scaling, thanks to its ability to properly use multiple CPU cores as well as the lower CPU overhead. It’s probably too much to hope for a doubling of performance with two cards, and DX12 is something newer games will have to explicitly support (i.e., none of the games we’re testing right now are likely to see DX12 patches, with the possible exception of The Witcher 3), but we’re definitely excited about the prospect of finally seeing our second (or third or fourth!) GPU put to proper use. If all goes as planned, we should start seeing the first DX12 titles by this holiday season. Ultimately, GTX 980 Ti SLI is the best current gaming solution for high-performance systems. Titan X SLI might be fractionally faster, but even GTAV “only” requires just shy of 6GB of VRAM with all settings cranked up, and most games are going to start hitting CPU bottlenecks with two GM200 cards. The biggest drawback (other than price) is that most places are currently cleaned out of 980 Ti inventory. We’re still waiting to see AMD’s counterattack that's coming out shortly, and by the time sufficient quantities of GTX 980 Ti are in stock, we might even know the summer 2015 heavy weight champion GPU.